Mission: To provide a vibrant, regional cultural destination that offers dynamic programming in arts, education, horticulture, and recreation for diverse cultures of all ages while ensuring a well-managed campus for all stakeholders. Accommodations: Artists are provided a studio space on the ground floor of a two-story, nineteenth-century cottage, which has bedrooms on the second level. 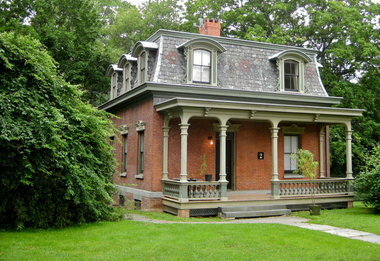 The unique opportunity is situated within 83 parkland acres of the Snug Harbor Cultural Center & Botanical Garden in the borough of Staten Island. The facility is connected to the art world of New York City, yet secluded from the urban center by a Harbor. Demographic: Artists in all disciplines at the post-BFA college level to make the transition from formal training to professional careers. Artist must be a New York State resident. Artist must have a Bachelors of Fine Art degree by the start of their Residency. eligible. Artist must be age 30 or under. Artist must not be represented by a commercial gallery. Benefits: Artists receive studio visits from guest artists and curators as part of a mentorship program. Participants are also encouraged to show recent work in the Cultural Center’s galleries or on the grounds. Edward and Sally Van Lier Visual Artist Fellowship $1,000: 2 month accommodation (studio/bedroom/kitchen/WiFi), 2 month studio space, 4 week exhibition in Newhouse Center for Contemporary Art, 1 public lecture, 1 open-studio day, Mentorship with guest curator/artist/museum professional, Professional Development Workshop: marketing, fundraising, networking, small business management, Access to Visual Art & Horticulture libraries. Posted in New YorkTagged 2 months, American, Art, art library, art residency, Artist, Artist Residency, arts, bedroom, BFA, Botanical Garden, career development, Contemporary Art, curators, Dance, Drawing, education, Edward and Sally van Lier, Emerging, Exhibition, Fall Residency, Fellowship, Film, fundraising, guest artist, guest curator, guest museum professional, Horticulture, horticulture library, Installation, kitchen, marketing, mentorship, Music, networking, New York, New York Community, New York Residents only, open studio, Painting, performance art, Photography, Photography Residency, professional development workshop, public lecture, Rate My Artist Residency, Sculpture, SHARP, Site-specific, small business management, Snug Harbor, Social Practice, Spring Residency, Staten Island, Stipend, Studio, studio visits, Summer residency, under 30, United States, Video, video art, visual artists, WiFi, Winter Residency, workspaceBookmark the permalink.